I don’t want to end up like my neighbors. Last year they tried different ways to mow their yard because it was such a painful process for them. Mowing it made them actually cry. Why? They had no grass anymore. Only wild onion growing. And to mow it made their eyes water. They tried goggles and taking ten minute shifts, switching between him and her. Always when they were done, the smell was so pungent, it would knock me for a loop. Like they had just made the world’s largest batch of salsa ever. The problem with wild onion is that you can’t just treat it with herbicide. Believe me, they tried that. They killed all their grass trying to kill the wild onion. And the persistent weed remained. The only hope they have now is to dig up their entire lawn and replant their grass. But instead, they hired people to mow for them. Seems fair. 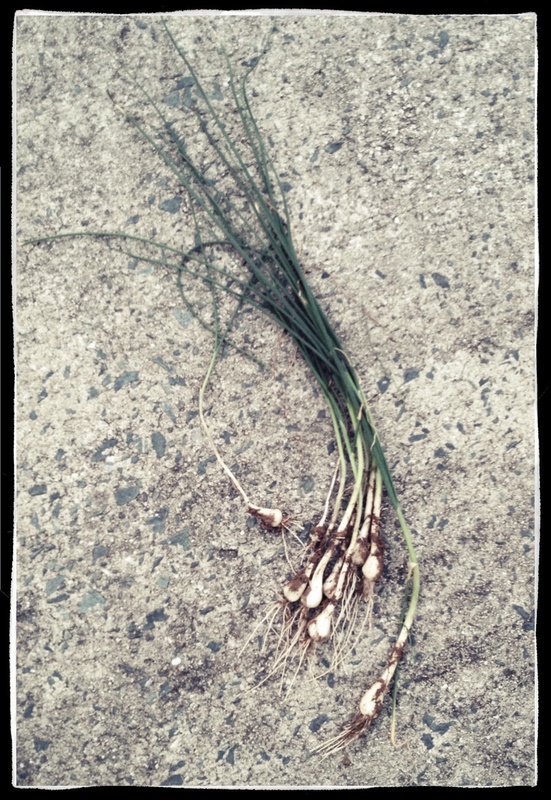 I have little tufts of wild onion scattered in my back yard. I have found my new obsession. Search and destroy. By hand. With infinite patience. It takes a delicate touch because as you can see from the photo above (taken today after I pulled them from my back yard), they end with a Big Fat Bulb. You can’t just rip them from the ground or the green leaf part tears off and the bulb sits in the ground laughing at you. Haunting you next year. So the best way to get rid of these suckers is to take a firm hold at the base, with a bare hand because a bare hand lets you feel if the bulb is going to give or the leaf will tear. Then you wiggle the onion in a tight circle, making the circle wider and wider. All the while, moving your grip down to the hole so the plant doesn’t break off. It’s best to do this when the ground is moist. There is such a feeling of victory when the bulb releases from the ground. That just spurs the madness. If I was smart, I would drop some grass or clover seed into the holes the bulbs leave behind. If I was smart. Welcome to my springtime fun.